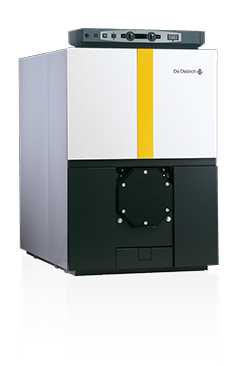 high efficiency boilers in the hydronic heating market. Eutectic Cast Iron boiler body provides exceptional resistance to temperature variations and thermal stress. De Dietrich’s eutectic cast iron is 30% more flexible than any competitive cast iron allowing safe low temperature operation. Four Inch Insulation featuring reinforced fiberglass wool. De Dietrich Boilers feature double insulation of the boiler front which minimizes heat loss and allows reduced stand-by consumption and improved thermal efficiency. Control Panel. The control panel supplied is designed for heating applications. The panel is equipped with a boiler thermometer, ON/OFF limit, high limit and manual reset limit. The large size permits it to be integrated easily with third party energy management systems. a list of available burners. Low Water Outlet Temperature down to 105°F with indoor/outdoor reset achieves significant energy savings by reducing stand-by fuel consumption. In addition, it’s not necessary to maintain boiler temperature between the two heating cycles, which further reduces fuel consumption and achieves excellent overall efficiency. Studies show substantial savings over retrofit boilers and over new competitive models.